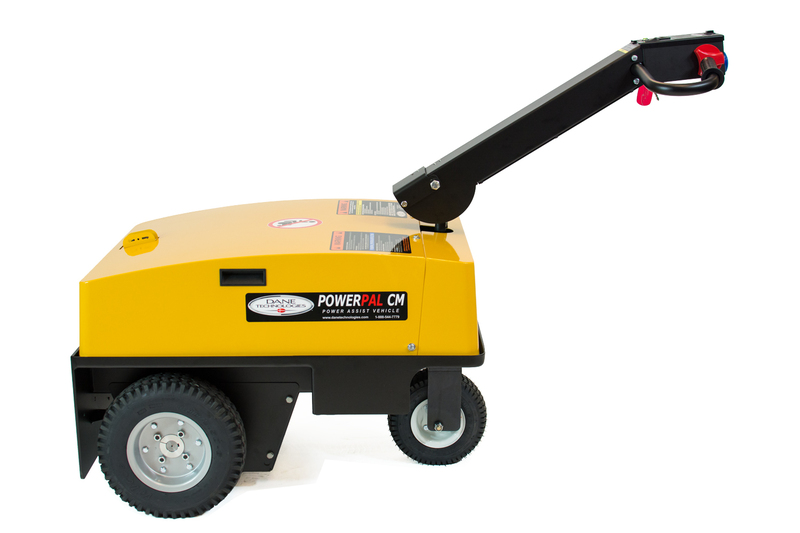 The PowerPal tugs and M3i cart mover series of Dane power tuggers are designed to seamlessly integrate into your workplace and effectively eliminate risks associated with industrial material handling, making your employees more productive and protecting them from strain-related injuries. Leading manufacturers rely on our tugs to move sub-assemblies, tow roll cages, push flatbed carts, or tow any heavy trailers. With a wide range of hitch options, Dane cart tuggers can move virtually any wheeled load. 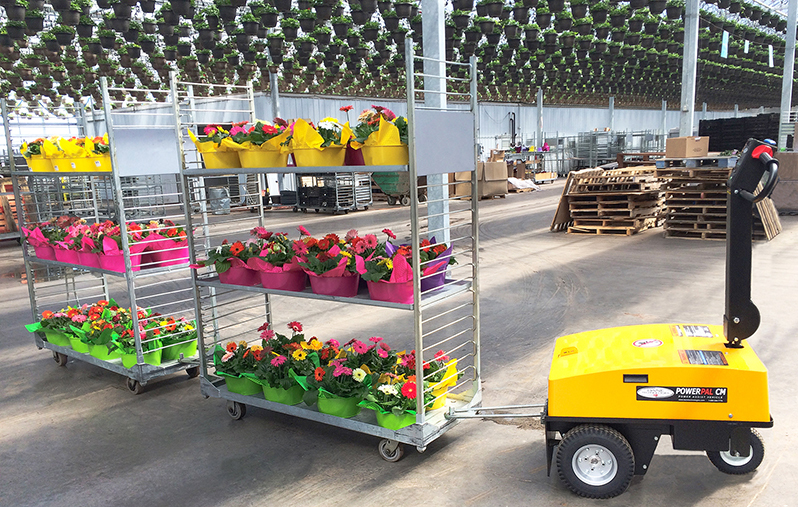 Implement AGV technology in your workplace by simply driving the PowerPal on routes in manual mode. The camera-based Co-Pilot guidance system automatically maps the environment, learning routes and waypoints. This creates a flexible and easily implemented Vision-Guided Vehicle that eliminates virtually all setup costs associated with traditional AGV systems. 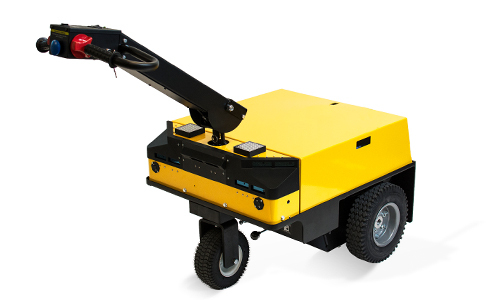 The PowerPal CM is rated for 18,400 lb (8,354 kg) and designed to pull industrial grade carts–increasing productivity, and reducing risk in the workplace. Tow trailers, roll cages, CC carts or anything on wheels without risk of strain or injury. Compact design, tiller steering and wide range of hitch options make the PowerPal Cart Mover the most flexible power pusher on the market. The PowerPal CM HD includes heavy duty upgrades & design features. 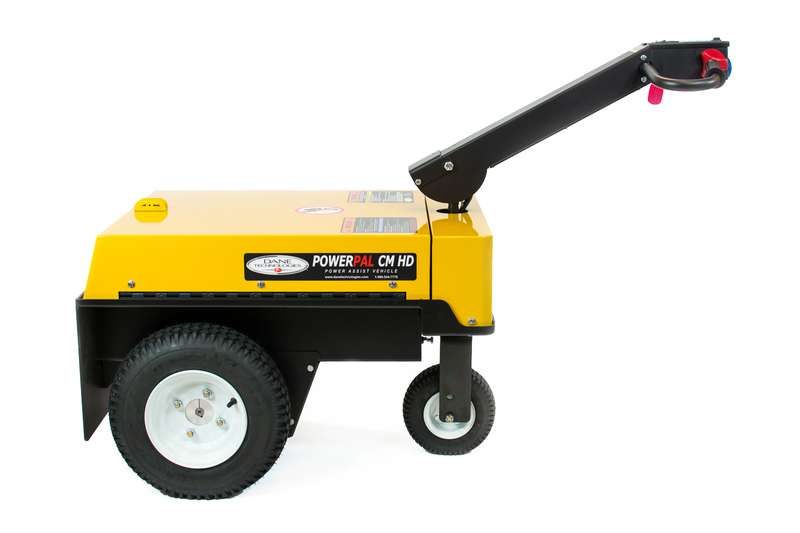 Powered by a 1.75 HP motor, the PowerPal CM HD is rated to tow carts up to 20,000 lb (9,080 kg). Housed in a heavy-duty powder-coated steel body, the CM HD offers tiller steering with optional dual-mode control and 16 in. knobby-tread tires, for moving heavy vehicles, carts, or trailers. 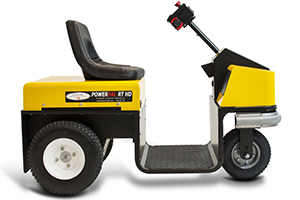 The PowerPal RT is a compact, powerful, and versatile ride-on tug for indoor or outdoor use, where maximum range and power are required. The RT can be configured as either a ride-on or stand-up model. Multiple hitch systems available with a 20,000 lb (9,071 kg) max towing capacity. Heavy duty upgrades available with the PowerPal RT HD. The M3i cart pusher is a industrial grade tug designed to increase workplace efficiency and minimize strain to the operator. The M3i platform allows for an optional 5th-wheel hitch package–the M3i5. Combining a 1.38 HP motor rated for pulling capacity of 18,400 lb (8,354 kg), a heavy-duty powder coated steel frame, and best in class controls the M3i and M3i5 deliver maximum control for towing carts and trailers. The M3i is ergonomically designed to increase capacity and minimize strain to the operator. The M3i platform allows for an optional 5th-wheel hitch package, the M3i5. 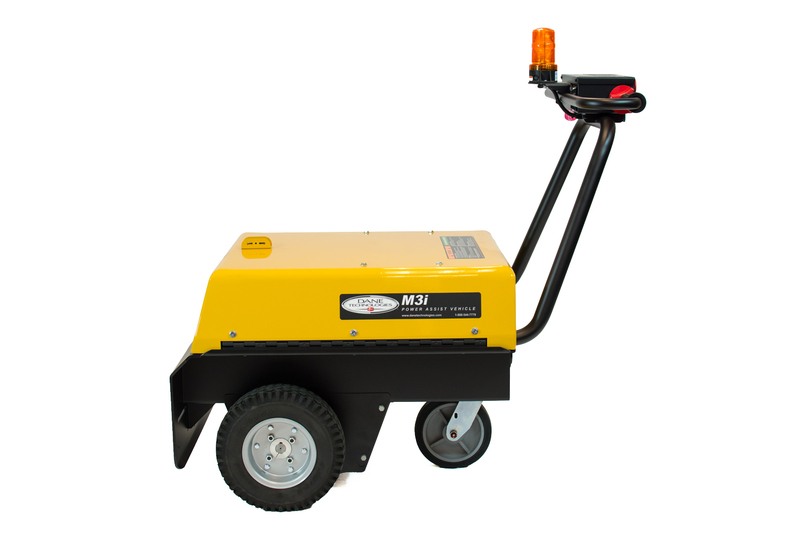 Combining a 1.38 HP motor rated for pulling capacity of 18,400 lb (8,354 kg), a heavy-duty powder coated steel frame, and best in class controls and electronics the M3i and M3i5 deliver maximum control in moving large items and remarkable productivity and safety returns. The M3i HD is the heavy-duty upgrade to the M3i. 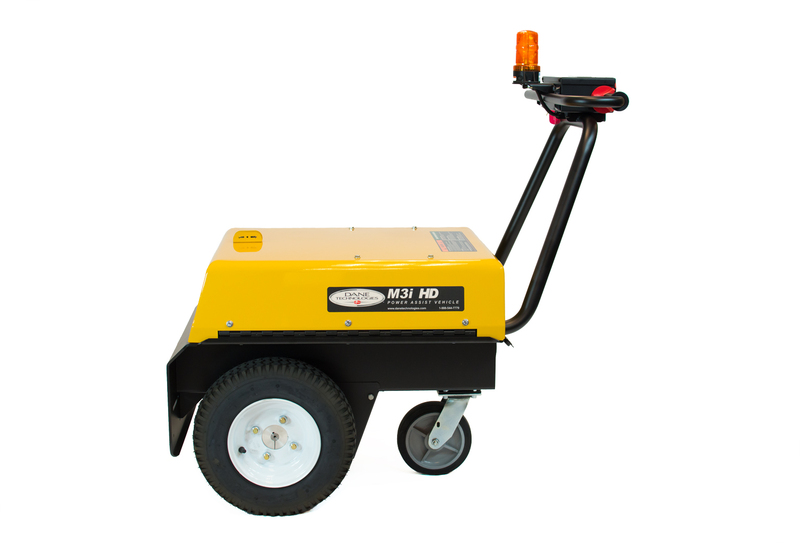 Combining a 1.75 HP motor rated to push/pull 20,000 lb (9,080 kg), 16 in knobby tread tires, a heavy-duty powder coated steel frame, and best in class controls and electronics, the M3i HD offers outstanding safety and productivity gains in a variety of workplaces. The M3i HD also allows for the 5th-wheel hitch package, the M3i5 HD for precise maneuvering of heavy wheeled loads.